I’ve become a giant margarita snob. I can’t drink any others. Don’t even show me that green stuff in a bucket. Just make one of these. Rim the ridge of your glass with a lime wedge and dip in a mix of margarita salt + sugar [I used about 3 tablespoons salt to 2 teaspoons sugar]. Fill the glass with ice. In a cocktail shaker, combine tequila, grand marnier, simple syrup and lime juice with ice, and shake for about 30 seconds. Pour over ice and squeeze in lime slices and add a few peach chunks. For peach simple syrup: combine equal parts sugar and water, bring to a boil and let sugar dissolve, then turn off heat and let cool completely. Combine 1 cup simply syrup + 3 peeled and chopped peaches in a blender and blend until combined. This makes enough simple syrup for 3-4+ margaritas, so I suggest playing with the amounts once you know how much syrup you like in your drinks! This recipe can be easily doubled, quadrupled, etc. Since everyone’s tastes differ, add simple syrup 1/4 cup at a time and go from taste. I also suggest buying the lime juice if you plan on making a pitcher (or 2) considering you’d have to squeeze a billion limes to get enough juice. And make me one while you’re at it pretty please? K thanks bye. Totally agree with you on the Grand Marnier addition. 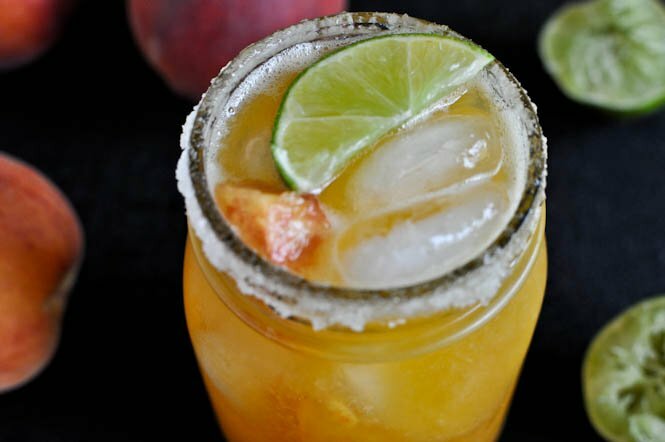 I’ll definitely have to try this because love both peaches and margaritas, so what better than to combine them! I had some extra peaches, and this was the perfect use for them. Delicious!!! I am blogging about these drinks today, thanks! Yum! I am also a huge margarita snob! This time of year is perfect for fresh marg makings! I made raspberry nectarine ones two weekends ago…now its time to try peach. I am sipping one now! Mmmmmmmm! I am thinking that this peach simple syrup would be awesome in some fresh iced tea! Thanks to you and your wonderful recipes I too have become a Margarita Snob! I love experimenting with the flavored syrups for a new drink! Love this recipe too! the recipe says equal parts of sugar and water, but what are the equal parts? a cup? 1/2 a cup? These are the best margaritas I have ever had-hubby agrees as well. For a couple of years now I can no longer stomach the pre-bottled margarita mix. It gives me a headache (positive it’s not the tequila, it’s really the mix!). I’ve been doing fresh lime ones for a while, but these peach ones seem to just have the perfect mix of sweet/sour. I think the best part of the recipe (and strawberry one too) is that you don’t have to strain the pureed fruit- I hate doing that because you end up with the tiniest amount. Thanks for such a great recipe!! Pingback: Things on the Internet This Week « Salaam Y'all!